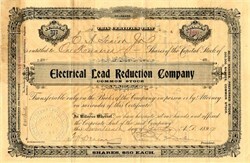 Beautiful RARE certificate from the Electrical Lead Reduction Company issued in 1899. This historic document was printed by Wm. E. Murphy's & Sons Banknote Company and has an ornate border around it. This item has the hand signatures of the Company’s President ( Pedro G. Salom ) and Secretary and is over 119 years old.